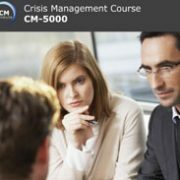 BCM Institute’s crisis management certification courses are internationally recognised and are the choice course for newly appointed crisis management coordinators as well as business continuity management coordinators who are tasked to take on the added responsibility of overseeing the organisation’s crisis management plans. We provide certification for crisis management practitioners from every level of competency and experience. Our courses are structured such that any practitioner can advance in their crisis management competency and at the same time acquire the right level of certification systematically. Each level of competency allows one to acquire the knowledge and competency needed in his/her job scope. There is also an express track course that allows one to acquire all these in 1 sitting. 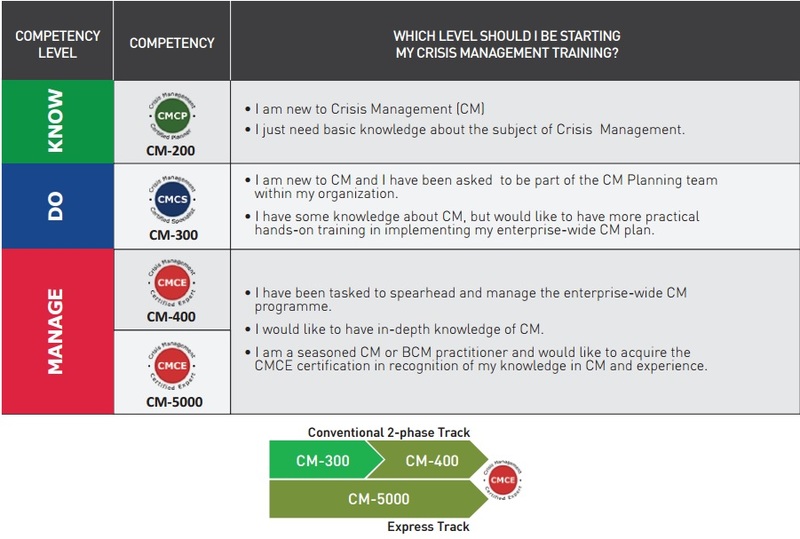 The express track course, also known as the CM-5000 Crisis Management Expert Implementer course is most suitable for recently appointed crisis management (CM) organisation coordinator. The same course is also well suited for seasoned practitioners who would like to get their experience certified and benchmark it against crisis management best practices. 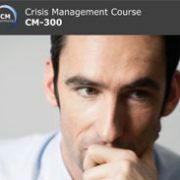 Alternatively, for practitioners who are business unit coordinators, they could look forward to the 2 Day CM-300 Crisis Management Implementer course which allows them to have the fundamentals of crisis management as well as be exposed to the basics of implementing a crisis management plan. They could also look forward to upgrading their knowledge to go on and attend the *2 Day CM-400 Crisis Management Manager course where the intricacies of managing a crisis management team and maintaining the crisis management plan would be discussed. * The pre-requisite of the 2 Day CM-400 Crisis Management Manager course is the 2 Day CM-300 Crisis Management Implementer course. This is a 1 day basic course on crisis management (CM) best suited for someone who wants to have a basic understanding on the subject. This is a 2-Day intermediate crisis management (CM) course that incorporates CM-200 syllabus on its 1st day. Best suited for BCM coordinators and newly appointed CM coordinators who would like to know how they can contribute as part of a CM team and decide on the best crisis management strategy, there is no experience pre-requisite for attending the course. This advanced 2-Day crisis management (CM) course is a follow up to those who have attended the CM-300 Crisis Management Implementer course. Here, participants will be taught the how to manage a crisis management flow of eevents as well as conducting advanced level testings such as integrated and simulation exercises. This is the most comprehensive and holistic crisis management course by BCM Institute. It covers syllabuses taught in CM-200, CM-300 and CM-400 courses. This 4-day course allows newly appointed crisis management personnel to have a thorough idea of crisis management and how to handle them as well as prepare the team for crisis through simulated exercises taught.